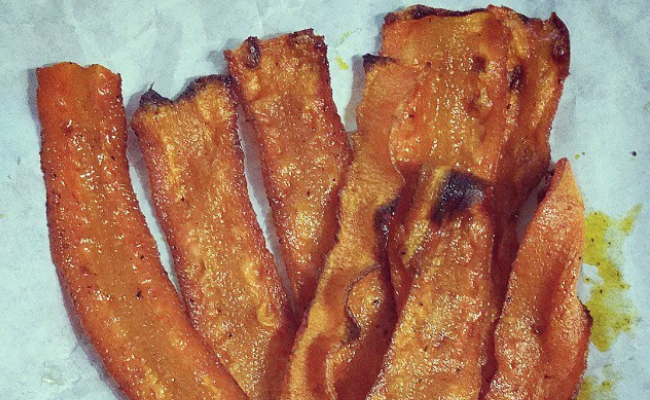 A lot of people say that they’d go vegetarian if it weren’t for one holdout: bacon. Yes, bacon might be delicious but there is absolutely no reason it has to come from pigs (or any other animal). It isn’t just about animal welfare either. There are many reasons to ditch bacon, like all of the health risks that it is linked to. Try this formula for a perfect vegan bacon alternative and you will never miss the real thing again. Why Do We Love Bacon Anyway? Once you know why bacon tastes so good, you’ll see that it is actually pretty easy to replicate it. The reason we love bacon is because it is loaded with fat and salt. Both are things that our bodies are hardwired to love. As for the fat, the consensus seems to be that coconut oil is best. Coconut oil is high in saturated fat, so it replicates the fat from bacon better than oils like sunflower, canola or olive oil. Don’t worry though. As talked about in this article, coconut oil mostly contains the healthy type of saturated fat called lauric acid. Maple syrup has a taste that we associate with bacon. You can also use other sweeteners like agave syrup or vegan sugar. Soy sauce, tamari and coconut aminos will all work for giving your meatless bacon the salty taste that our bodies are hardwired to love. To really take your vegan bacon up a notch, add some liquid smoke, paprika, or onion powder. Don’t be afraid to get creative! Mix all of the ingredients except the eggplant together in a bowl or Ziploc bag. Put the eggplant strips in and let them marinade for at least 1 hour. Put a bit of oil on a griddle and heat to high. 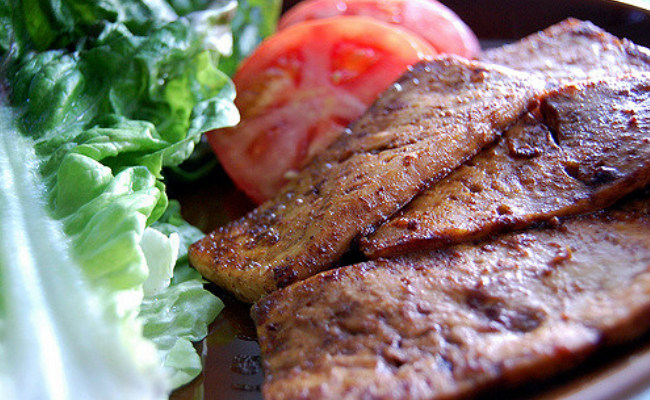 Carefully place the marinated eggplant strips on the griddle and let them cook until they have griddle marks. ← Make Homemade Ketchup in Just 2 Minutes!